Browse: Home /	Community Building, Community Gardens, Events, URBAN FARM & GARDEN / End-of-Season Workday Party at our Healing Herb Garden! 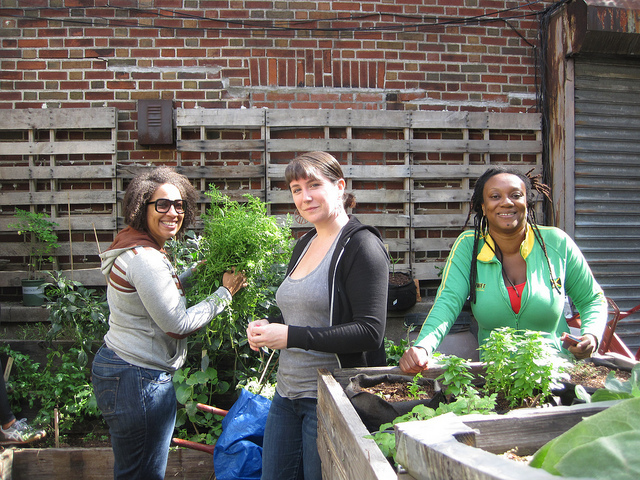 Sustainable Flatbush Healing Herb Garden is having a season closing workday party on November 2 and you are all invited! Help us winterize the garden and harvest the last of our medicinal herb plants. Our friends from Sacred Vibes Apothecary will be there to share their knowledge on how to use different parts of the plants – flowers, leaves, and roots. This will be a fun and family-friendly event and a great opportunity to be outdoors before the cold weather kicks in for good. The forecast is for partly sunny skies with highs in the sixties! We’ll provide some special and healthy refreshments — some made from our very own herbs! And we’ll also have a few special treats available (in limited supplies): potted herb plants to grow indoors over the winter, and medicines (oil, spray, or tincture) made with herbs from our garden. See you at the garden – last time this year! Uh Oh… We’re On TV!